On Sunday afternoon, before all of the craziness erupted in London, we took part in SWCraftClub’s pop up craft event at the Landor pub in Clapham. It’s difficult to picture a more contrasting scene to the madness that came later that evening. 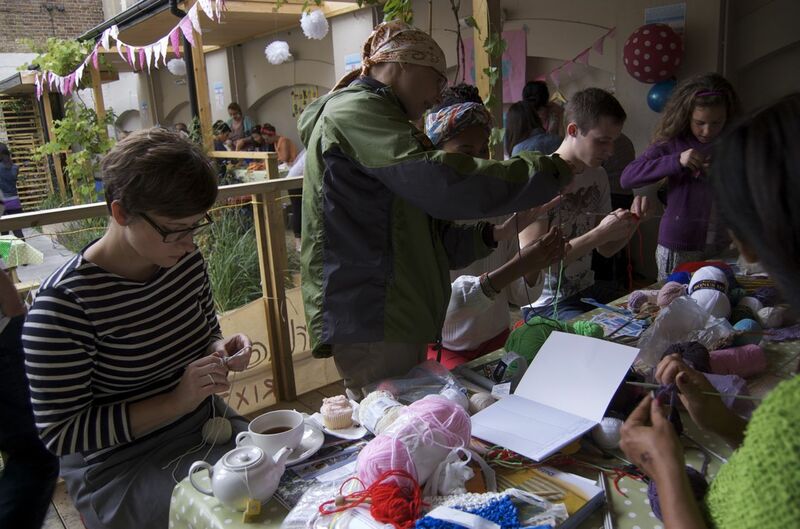 Around eight groups of crafty folks got together in a pub garden to help people make badges, jewellery, mood boards and upcycle their wardrobe. 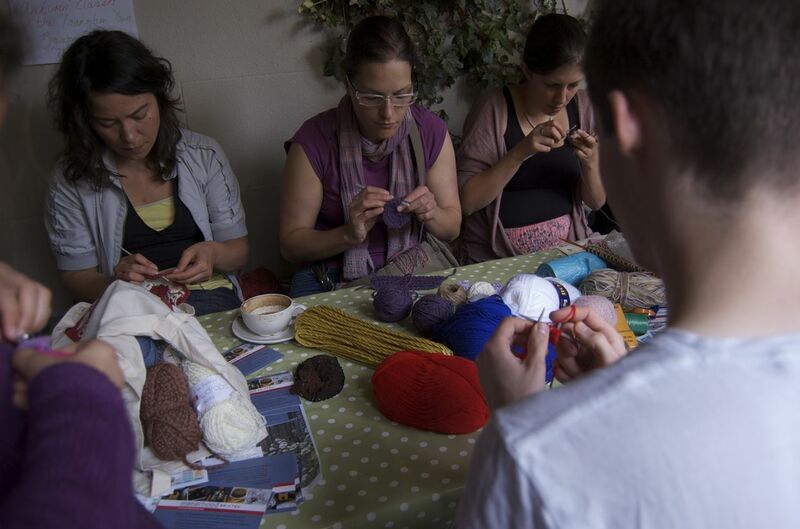 Makerhood’s contribution was a knitting and crochet drop-in workshop. We had two experts, Viv and Shona, on hand to get beginners started and to teach new techniques to those who were more advanced. And they did a brilliant job! Over the afternoon they taught crocheting to complete beginners, polished up rusty knitting skills and handled every request for advice that skilled knitters and crocheters threw at them. We’d prepared a wide range of materials for people to use, including wool of course, but also recycled T-shirts, plastic bags, string and ribbon. These supplies were topped up by Hobbycraft who sponsored the event. Thanks Hobbycraft! One of the nicest things about knitting is that it’s a slow, monotonous craft. This was also something that concerned us before the event; would people be prepared to commit their time or would they simply pass us by on their way to more immediate rewards? Well, the answer is that they were prepared to commit the time – at some points we had so many knitters that we ran out of seats and our experts had to stand. And the best thing was that the slow pace meant that we got to have proper chats with people, we learnt who taught them to knit, the others crafts they enjoy, about their children and homes, what they like and don’t like about the place they live. Chat and knitting. For me, there’s no better way to spend an afternoon. Thanks to all the people who joined us and knitted and crocheted with us. Special thanks to Zoe from SWCraftClub for inviting us to be part of this event. Follow @SWCraftClub on Twitter and SWCraftClub on Facebook or check out http://swcraftclublondon.blogspot.com for more crafty events in South West London. And also to our experts, Viv and Shona. 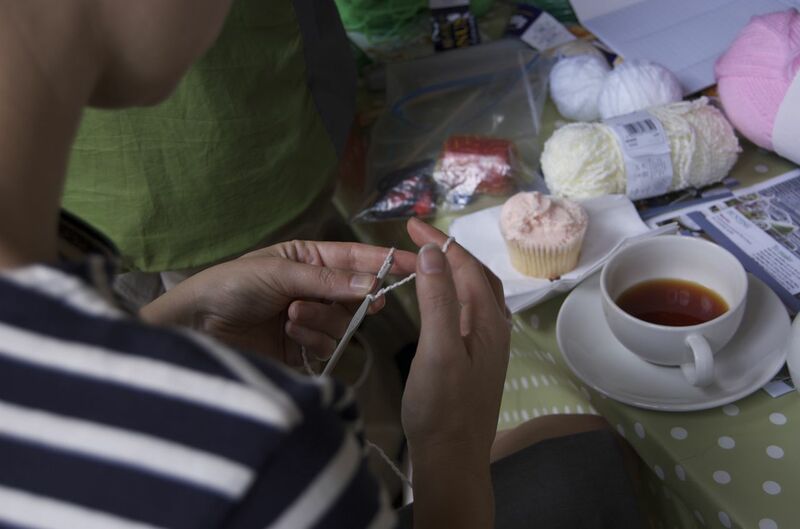 Viv is as talented at sewing as she is at knitting – check out her stall on Makerhood. Shona is planning some workshops to teach beginner’s knitting in the autumn. 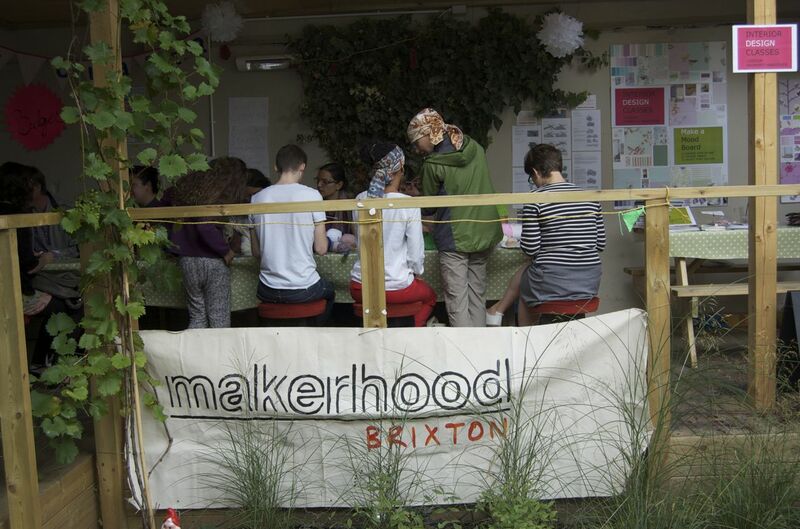 If you’re interested in taking part contact us on hello@makerhood.com and we’ll pass on your details. Thanks to everyone that participated. Please email me if you need some help or some further direction.